An interview with author Ginger Garrett on the topic of Bible Beauty Secrets is below. What did ancient women know about beauty that we can learn? How did they use natural foods and ingredients to enhance their looks? Also don’t miss the free sample recipe of Rich Milk Body Wash courtesy of Ginger. Carrie: We are joined by Ginger Garrett, author of Beauty Secrets of the Bible: The Ancient Arts of Beauty and Fragrance. I really enjoyed your book. I’ve got a million pages dog eared with all these great beauty tips I want to try. Ginger: It was so much fun writing it! C: Yeah I bet. 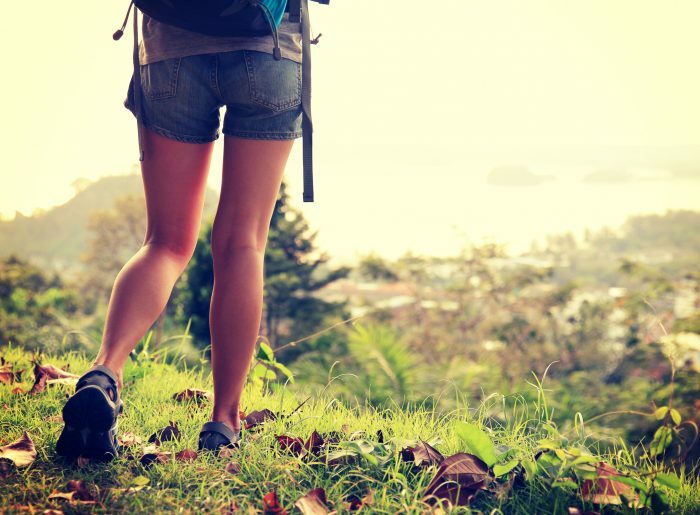 You don’t ordinarily think of the Bible as being a book of health or beauty. G: It’s interesting though. Ancient women were just as concerned about beauty as we are. They had wrinkle treatments and blemish treatments. Really anything we do, they did too. C: You know that make sense. It really does. It’s perfectly natural. If you have a daughter, even as a toddler they get into your makeup and put on your high heels. So it seems like it’s just a natural thing! G: Absolutely. We’re born to be creative. C: I thought it was interesting that the first half of your book actually doesn’t delve into specific recipes or beauty treatments. But it’s focusing on what true beauty is. I enjoyed reading that section. G: Good. You know especially for moms, we’re so responsible for bringing up our daughters in a healthy way and to have a healthy view of their appearance. Because certainly they go out into the world and it tells us that the only thing that matters is what’s on the outside. But the ancient women in particular had a very holistic view of beauty. They didn’t separate appearance from body. They felt like whatever they did to their body would affect their spirit, and they were very careful about how they presented themselves. C: That’s right. Absolutely. And that does mean a lot. Your book also talks about diet, and specific foods that were very popular in Bible days and among ancient peoples. First of all I wanted to ask you, what made you want to sit down and write this book? 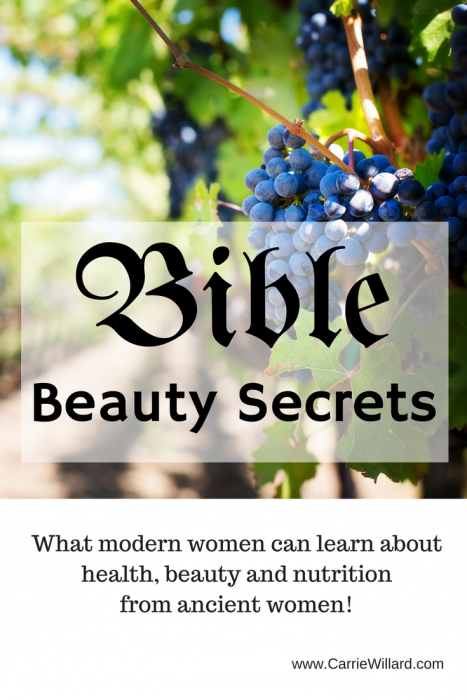 Why were Bible beauty secrets an interest of yours? G: I had written a novel that was based on Queen Esther from history. And her story was that she spent one entire year doing nothing but getting beauty treatments, so as I researched her story I would try to uncover what she would have been using and at first I thought, it was 3,000 years ago, they weren’t sophisticated. That’s what I thought! I got into it and realized that the ancient women were really more sophisticated than we are about beauty. And about health and their approach to it. And I had so many reader requests. They wanted to know more. How can I try the things that she was using back then? I ended up putting this book together. C: Right. I’ve always thought that story of Queen Esther was so fascinating, the way that she presented herself. She was a powerful woman and she was loyal and courageous. But she got the job done. She set a great example of how to be strong and a powerful woman without some of the negative connotations around that. You can be feminine. And you can be respectful and dignified and accomplish amazing things. G: That’s right. And I also love her story because she was taken out of her home at a young age and forced to live in a harem where she was nothing but a pretty face. Yet she rose above it, she didn’t rebel in a way that made her a coarse or angry person. She just acknowledged the reality of the culture she was living in. And yet she became this incredibly strong vibrant woman. I think, as I raise my girls, that’s how I want to raise them. If we can acknowledge that the world around them wants them to be beautiful and places way too much emphasis on that. I just want to encourage them it’s ok to want to be beautiful. It’s ok to be affected by that culture. But let’s talk about how we can rise above it. Let’s talk about what true beauty is. C: Right. So let’s talk about some of the healthy foods that are talked about in the Bible. Like almonds and flax and even vinegar, do you want to bring up some specific things that you found in your research about some of those – we call them super foods nowadays. G: That’s right. What was interesting to me was that, what the ancient women did naturally, what they reached for, they believed worked. But science today is telling us that it works very well. Like let’s take vinegar for example. Vinegar was a household staple in the ancient world. Today there’s a lot of research going into vinegar because of the acetic acid, which is present in any vinegar. Red raspberry or apple cider, actually science tells us can slow the absorption of carbohydrates. And it works as well as some diabetes drugs. So if you are pre-diabetic, if you struggle with blood sugar or excess weight, you might consider adding a couple of tablespoons of vinegar to a glass of water right before a meal. It will stabilize your blood sugar and slow the absorption of carbohydrates. Another great one is almonds. That was just a natural food group back them. And today we re getting to understand how many phytonutrients and antioxidants the almonds have. I always say to buy them raw. Because the white part that’s inside the meat has about 20 different antioxidants and then the brown papery covering, that has antioxidants. Carrie: Wow. I had a friend who was an elderly gentleman. He was very vibrant, very healthy. He lived a nice long life, and died peacefully in his sleep with no health issues at all. Very physically active, he worked until the day he died. And his health tip was: every morning on an empty stomach, he swore by drinking a little apple cider vinegar in a cup of water. That was his cure-all. Ginger: There are so many people who really do swear by vinegar. And if you can’t stomach the taste of apple cider, you can try any variety. A lot of people like red raspberry vinegar, it’s a little sweeter. 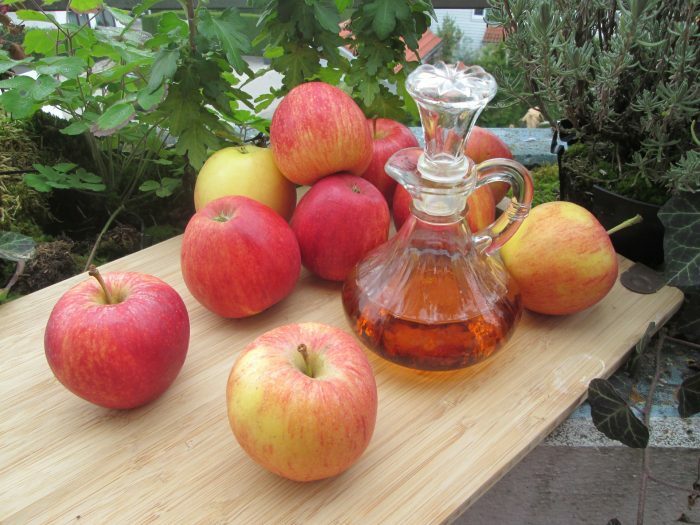 The active ingredient in vinegar is acetic acid, which is present in all varieties. So you can experiment with the different flavors. But you’re right – people swear by vinegar. And it’s so rich in enzymes. I interviewed a Ph.D. in nutritional science for the book. One of the things he told me was that half of everything we know about antioxidants and phytonutrients has only been discovered in the last couple of years. So we are just now beginning to understand how incredibly powerful these natural foods are. Particularly at fighting inflammation such as arthritis. C: Women in Bible times had one advantage over us, and that is that they ate a whole foods diet because there was no such thing as fast food, there was no white flour. The whole grains that they did eat were very coarsely ground like the Ezekiel bread in the health food store. So it was a whole different kind of a grain. People nowadays really vilify carbohydrates and bread. But bread has always been a mainstay of life, they call it the staff of life. But it was the kind of grains they were eating that made a lot of difference. You mention this in your book. G: That’s right. It does make a big difference. I also like that the ancient women had a very different approach to food. To them, food was a sign of blessing and abundance. They believed in eating until they were full. They celebrated food. Whereas today, we’re very afraid of it, we’re afraid of bad carbs versus good carbs. People will tell us you can’t eat bananas or you have to eat them but only eat them after 3 and if they’re paired with apples… there’s so much craziness around food. I think we’ve almost forgotten how to celebrate that we have enough. And what an incredible blessing that is. C: I really like what you have to say on page 56 where you talk about the history of “weak versus the strong woman”. You’re encouraging women to engage in strength training which is so important for prevention of osteoporosis and preventing bone loss in later life. And I’ve noticed that since I’ve turned 30 that there has been a change – I have to work harder to maintain my weight, it’s never been an issue before. You talk about how the real hyperfeminine kind of weak woman who has to keep smelling salts handy – how that came into vogue. Do you want to talk more about that for a minute? G: That to me was so fascinating. Both the history of the weak woman and the history of the diet were compelling! Prior to the industrial revolution, women had to be strong because we ground our own wheat, we got our own water. A lot of us lived very close to the land, so when men were looking for wives they wanted a healthy, strong woman because they needed a partner in their life. When the industrial revolution hit, suddenly we could buy bread and we could go to the store and purchase anything that we used to make. And women were displaced. By and large the industrial revolution was a man’s movement. So women were displaced. Suddenly, being very weak became fashionable. It was a status symbol for a man – he knew he was wealthy when he could afford a woman who wasn’t a partner, who was too weak to help him in anything. So we became trophy wives at that point. So I try to pick apart how we got to where we are today, that weakness isn’t an inherently feminine quality. And we should never be afraid to be strong, because my strength only accents my husband’s strength, it never diminishes it. C: And a good man sees that! I like how you quote Proverbs 31 because that’s a beautiful chapter. That woman was in no way weak or unintelligent. She conducted business, she bought and sold property, her husband and community respected her. Let’s talk about some of the specific beauty treatments and recipes that you mention in the book. For instance, honey. A lot of times people think of honey as “ooh, gross and sticky and I wouldn’t want to put that on my face”. Tell us about that. G: I interviewed a man named Christopher Watt. He is facialist to the stars, his most famous client is Jennifer Lopez. He told me that the biggest celebrity secret for glowing skin is honey. I thought oh, here we go! He said no there is a secret to it and he’s right. While your skin is still wet after your shower or after you wash your face just take ONE drop of honey, maybe two but go light on it. Rub it between your palms and pat it in gently and remember, your face and your hands should be damp or wet. On a wet face, just one drop of honey gently patted in. 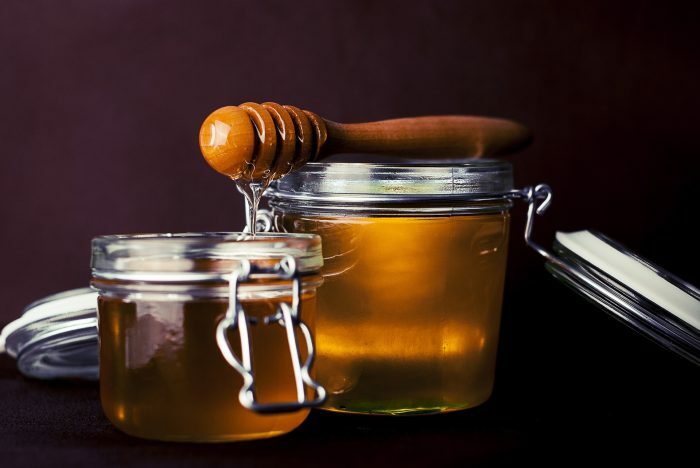 Honey is rich in amino acids and proteins and enzymes and minerals. It’s also a very powerful humectant and anti-inflammatory. So when you put it on your skin, it’s going to plump up those little fine lines and wrinkles and it’s going to fight blemishes and give you this gorgeous glow. The first time I tried it I got out of the shower and used my one drop of honey. And I remember when my husband came into the bathroom and he said, “Wow, what did you do to your face – you’re glowing!” That is my favorite beauty tip. C: Speaking of olive oil, I was looking at some beauty product the other day and I saw that it had squalane in it, and I learned years ago that squalane is just a fancy word for olive oil. So it’s very, very expensive to buy products with squalane in them. Isn’t it funny that you can buy organic olive oil for less than $10 and get a huge bottle of it that will last you for years in your bathroom. I use it to remove mascara and as a moisturizer sometimes. And I cannot see a dent in the bottle that I purchased a year ago! G: The interesting thing about cosmetics is, it’s actually legal for them to lie to you on the label. You can go to the FDA’s website and they will say that in black and white. Really any claim, even the ones that they know are bogus, are allowed on the label. The only claim they can’t put on there is that it’s a drug or has an affect like a drug. So you’re right, they don’t have to tell you that you’re paying $50 for a half ounce of olive oil. Olive oil again is one of those natural products that’s packed with antioxidants and phytonutrients. It’s great for your skin. There’s also some evidence coming out now that they don’t know what it is in olive oil, but there’s something in olive oil that may give you an extra layer of protection against skin damage from the sun. Any time you can choose a natural beauty treatment or a natural food, you’re going to be multitasking. Because you’ll be moisturizing your skin but you’ll be getting all these additional benefits. C: Well this has been so interesting Ginger, and I encourage anyone who likes to use natural beauty products and who wants to save money to get a copy of your book and keep it on hand. You have a lot of really great ideas in the book and recipes for healthy eating and also for your skin. Ginger Garrett was kind enough to let me share a recipe from her book. Here is one I picked. Let us know how you like it! Process the oats in a blender until extremely fine and mix well with the dry milk. Store in an airtight container. To use as a face wash, sprinkle 1-2 tablespoons into your palm and work into a paste with warm water. Scrub the face gently and wash. Can also be used as a body scrub and in the bath as a luxurious soak. The lactic acids in the milk are a natural source of alpha hydroxy acids that help fight the signs of aging, and the oats soothe and manually exfoliate the skin. Together, these ingredients will leave your skin unbelievably soft and supple. the markest is a rip off! Well good post! If you want to maintain your natural beauty skin care , you need to take care of your overall health. Everyone is born with natural beauty, but we need to take the best care of what we are given and enhance the naturally beautiful features that we have. There are several steps you can take to make your overall appearance more healthy and attractive. Nice tips. It’s really important to take care of how we look because sometimes we are just judge by how we look.